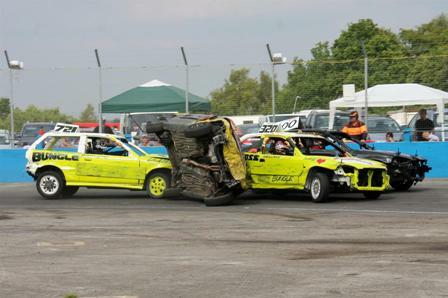 Spedeworth Bangers are designed to be cheaper and simpler to prepare than their National Banger cousins, but the drivers will tell you they are no less fun to race. 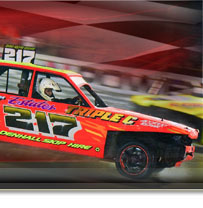 The Banger formula is designed to tempt you, the spectator off the terrace and onto the track. The cost and preparation are kept to a minimum in the Bangers. The cars used are all generally standard cars, with the radiator being kept within the engine bay, although there is still enough contact to keep the spectator interested! So, why not give it a go and get that "old banger" off your front garden...! The biggest race of the year for the Bangers is the World Championship which is held at Foxhall Heath Stadium, Ipswich on Saturday 16th November at 5pm! The following meetings carry a Wildcard place where the winner of the final carries an automatic spot into the World Final race at Ipswich on Saturday 16th November 2019 plus at each round points are scored on every race on the day for the top 10 finishers – 20-18-15-12-10-8-6-4-2-1. The following meetings are World Qualifying Rounds – in these meetings ONLY, points are scored on every race on the day for the top 10 finishers – 20-18-15-12-10-8-6-4-2-1. Full attendance points can only be scored if the driver has booked in advance for the meeting and the booking is accepted during office hours - Monday-Thursday 9am to 5pm & Friday 9am to 1pm. A driver turning up without booking in will score only 5 attendance points irrespective of the announced number of attendance points allocated to the event. Drivers booking in for any Banger meeting, failing to cancel, and not showing up, will have the relevant points for that meeting deducted from their total – i.e. if they would have scored 10 points for being at that event they would have 10 points deducted. The top 17 Spedeworth registered drivers after the final meetings on Wednesday 16th October 2019 will qualify for the World Championship on Saturday 16th November 2019!